It stands at a towering 168 feet tall and opened just two years ago, but Schlitterbahn Kansas City’s Verrückt waterslide is about to come down. Drained with visible rust stains, Verrückt has been closed since August 7, 2016 when 10-year-old Caleb Schwab, son of Kansas state representative Scott Schwab, died while riding the slide. According to a police report, Caleb died of a neck injury. Two women on the raft with Caleb also suffered facial injuries. 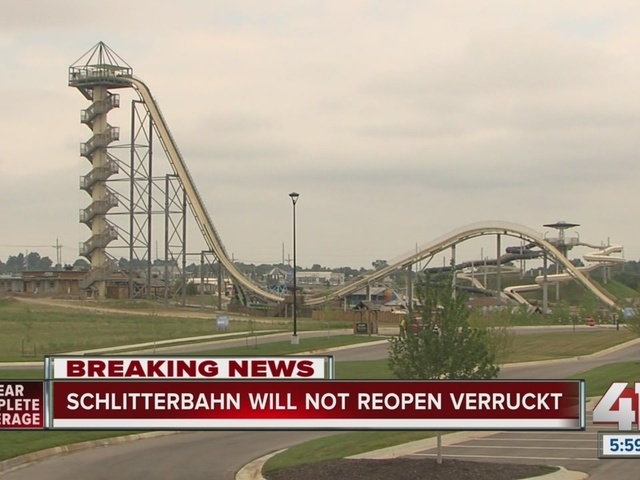 On Tuesday evening, Schlitterbahn Waterparks and Resorts released the following statement, saying once the investigation is concluded and permission is given by the court, "Verrückt will be decommissioned – closed permanently and the slide removed from the tower. In our opinion, it is the only proper course of action following this tragedy." All of us at Schlitterbahn have been heartbroken over the tragedy that occurred on Verrückt. In our 50 years of providing an environment for families and friends to gather, we’ve never experienced this kind of devastating event. The safety of our staff and our guests is our top priority. We are parents and grandparents ourselves and many of us have ridden Verrückt with our own children and grandchildren over the years it operated. 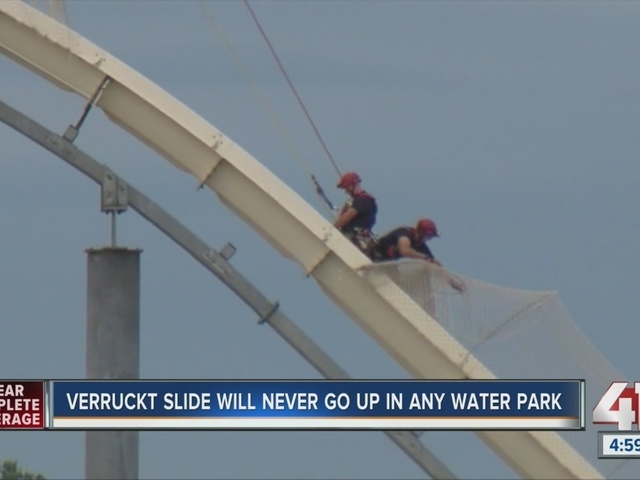 Once the investigation is concluded and we are given permission by the court, Verrückt will be decommissioned – closed permanently and the slide removed from the tower. In our opinion, it is the only proper course of action following this tragedy. We will, at some point in the future, announce what will be built in its place. We continue to fully cooperate with investigative teams and work with the families, their attorneys and our staff impacted by this accident. As we move forward, we assure everyone who works for us and the community: we remain wholly committed to our Kansas City park and the original vision of Schlitterbahn – providing a great place to work and an environment for families and friends to gather together. The announcement comes as the criminal investigation into the tragedy is not yet complete. 41 Action News reached out to the Kansas City, Kansas Police Department who confirmed criminal charges are unlikely but the case remains open. The homicide detective, still holding onto the ride's rafts, netting and metal frames, is about done with the investigation. "On behalf of the Schwabs, I have been working in conjunction with Schlitterbahn and their attorneys in permanently decommissioning the slide and ensuring that it is eventually torn down. The slide cannot be torn down until all investigations and potential litigation has concluded." It is still unknown if the public will ever find out what went wrong the day of the tragedy because the case could be settled before going to court. On September 7, 2016 – days after Schlitterbahn closed for the season - 41 Action News watched as a team of attorneys and experts for the Schwab family and the two female passengers inspected the slide. Meyerkord is a personal injury attorney in Kansas City. He's not involved with the Schlitterbahn investigation but talked with 41 Action News in September and explained what investigators might be looking for.